Dr. David Spilkia, dentist at David Spilkia Family and Cosmetic Dentistry, provides a variety of services to patients in and around Philadelphia, PA. This includes orthodontic services such as Invisalign. Dr. David Spilkia works with patients and helps them compare their options, including traditional braces. Orthodontics is a fantastic way for patients to achieve a more attractive smile. When misalignment is a concern, patients may feel as though their only option is traditional braces. Thankfully, metal brackets and wires are not the only choice for teenagers, men, and women. Invisalign orthodontics is a wonderful solution that many patients at David Spilkia Family and Cosmetic Dentistry want to learn more about. This treatment is more discreet than traditional braces, using clear aligner trays that are placed over the dental arch and gently move the teeth into better alignment. When patients want to look their best, even throughout treatment, Invisalign is often the choice that stands out. There are many benefits to using Invisalign when compared to traditional braces. Invisalign is a discreet solution, as the aligner trays are completely clear. When patients are wearing their trays, others will not even know! Invisalign is more comfortable. 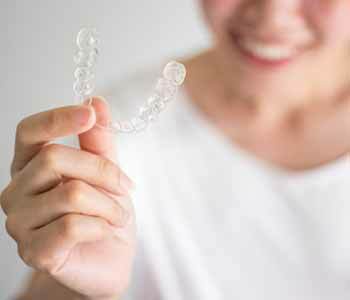 Instead of dealing with metal brackets and wires that can scratch and irritate the soft tissues of the mouth, Invisalign aligners are smooth and extremely comfortable when worn. Invisalign is easy for patients to use and care for. The trays are worn two weeks at a time during the day and night, and only removed for brushing, flossing, and eating. Invisalign protects overall oral health and wellness. This is due to the face that the trays can be removed, making it easier to brush and floss without dealing with metal brackets and wires in the way. This greatly reduces the risk of issues such as cavities and periodontal disease. Invisalign is affordable, often comparable in cost with traditional braces. Invisalign works quickly in achieving a beautiful smile that patients can be proud to show off to others. Patients start with a consultation appointment with Dr. David Spilkia to determine if they are an appropriate candidate for treatment. Patients who are best suited for Invisalign are individuals with mild or moderate misalignment. For some patients with more severe misalignment, traditional braces may still be considered. However, if patients choose to move forward with Invisalign orthodontics, they then undergo a series of digital impressions. These digitized images are sent to the Invisalign laboratory where a series of clear aligner trays are fabricated to reposition the teeth from start to finish. The number of trays in the series will vary, depending on the severity of the misalignment. Patients are educated by their dentist on how to use and care for their aligner trays, ensuring that the process is achieved in a fast and effective manner. If patients do not comply with treatment, they may end up dealing with added costs, longer treatment times, and the fabrication of extra trays to correct errors. Patients must wear their trays day and night, at least 20 hours a day, to see the results they expect. Absolutely! We find that Invisalign orthodontics is a terrific way for patients to get the smile they’ve always wanted without the appearance of metal brackets and wires. Invisalign is an effective solution that patients can use to reposition the teeth into better alignment. Invisalign is often the best choice for many of our patients, young and old! At David Spilkia Family and Cosmetic Dentistry, we encourage patients to take the time to learn more this orthodontic option comparable to traditional braces. This amazing option provides patients a way to enhance their smiles while avoiding the imperfect appearance of metal brackets and wires. Contact our Invisalign preferred provider today by calling (267) 463-2777 or visiting the office at 7052-56 Frankford Avenue in Philadelphia, PA.